Translated to English by James Newton. PRESENTATION: This software is conceived to draw electronic diagrams, chronograms, and to print the drawing. The dimension of the diagram is thus limited to a A4 sheet or 270x195mm (useful zone). It respects the conventions of Windows, and so is very easy to learn. It does not claim to compete with the professional schematic capture programs, because it cannot generate Netlists, but it has a large advantage: it is FREE! the key ' R ' to rotate the selected elements. TO PLACE COMPONENTS: Choose the file, and the name of the component in the drop-down lists, and click on the icon symbolizing a resistance and a condenser in the tool bar. You can turn the components by pressing on ' R '. You can reverse the component horizontally ' H ' or vertically by pressing on ' V '. Then place the component while clicking with the left mouse button. To stop, click with the right mouse button or press on the key ' Escape '. The keyboard short cut to place components is ' P '. TO PLACE JUNCTIONS, CIRCLES, AND OTHER SYMBOLS: Proceed in an identical way. The keyboard short cut to place junctions is ' J '. The keyboard short cut to place wires to a bus is ' E '. The keyboard short cut to place Masses is ' G '. The keyboard short cut to place ' References towards another diagram ', is ' S '. TO PLACE WIRE, BUSES OR LINES: Click on the button ' Wire ', ' Bus ', or ' lines' in the tool bar. Then click on the screen to place the beginning of the wire, move the mouse to the next section and click again. To finish the wire or the bus click with the right mouse button or press on the key ' Escape '. To leave this mode click again with the right mouse button. The keyboard short cut to place wire is ' W '. The keyboard short cut to place buses is ' B '. TO PLACE TEXT: Click on the button ' Texte' of the bar of tools. A window appears, types your text and presses on button ' OK ', a rectangle symbolizing the text appears, place at the place wanted while clicking with the left button of the mouse. To stop click with the right button of the mouse or press on the key ' Echap '. If you type the letter R and that you notch the box ' Incrementing automatique' from 1, you will be able easily to place the references of your resistances R1, R2, R3, ect.. The keyboard short cut to place text is ' T '. SELECTION Of ELEMENTS: The circles are selected while clicking on their center. The wire, buses and dotted lines are selected while clicking on their ends. You can select several elements by drawing a rectangle, by holding down the left button of the mouse, and by draging the mouse, without releasing the button. Note: once you have made a selection, you can edit this selection with the contextual menu (click with the right button) or with the Edit. CASE Of SUPERIMPOSED ELEMENTS: When several elements are superimposed, such as, for example, several wires connected to the same place, you can dissociate them. While pressing on the ' Shift' key, after each click, the elements appear selected one by one. It is then very easy to separate them. Note: if 2 identical elements are superimposed, the selection of the 2, makes disappear posting, erase one of the 2 then. RENAMING Of A COMPONENT: You can also use the ' Shift' key to change or move the name of a component. For example if you want to change a 74HC00 for a 74LS00, press on the ' Shift' key and click on the name of the component, that Ci appears selected then. You can now edit it with the contextual menu (right mouse button). Idem for the numbers of legs or the symbols of food. Copy: You can make operations copy towards other applications like ' Word ', or ' Paint Shop Pro '. To copy part of a diagram towards another diagram, select the starting diagram click on small ' the Edition ', and ' To copy '. Then click on small ' the File ', and ' ouvrir' to open the diagram of destination, click on small ' the Edition ', and ' To stick '. 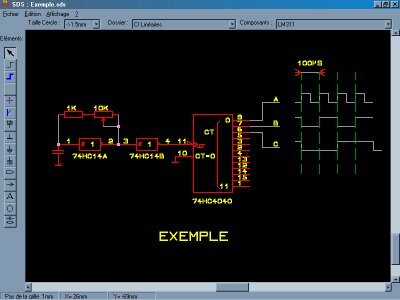 TO MAKE YOUR OWN COMPONENTS: Very easy: Draw your component as if it were a diagram with the regular tools (wire, bus, junction, ect..) without worrying about the color. Then save your component with extension ' CMP' in a subdirectory of ' \Composants\ '. The new component will appear automatically in the drop-down list, and its color will be correct!. To remove a component just erase its file. To modify the component, open the corresponding ' CMP' file and modify it. Easy ways: do not hesitate to change the step of the grid (0.5 mm) You will obtain finer details. Always respect a minimum spacing of 2mm between the legs of components. To draw arcs of circles, place a circle of the good diameter, and draw lines over. Then, erase the circle. If you develop new components, send them to me to the address: b.urbani@free.fr I would place them at the disposal of all!